Planning for spine surgery called Laminectomy? Conditions such as herniated disk or slipped disk both compresses any of your spinal cord or spinal nerves. Both occur with aging. You may need to undergo surgery when all other options such as physical therapy, medication or other non-operative therapies fail to address your condition. So, that is when the possibility of surgery can come in handy as the last best resort. 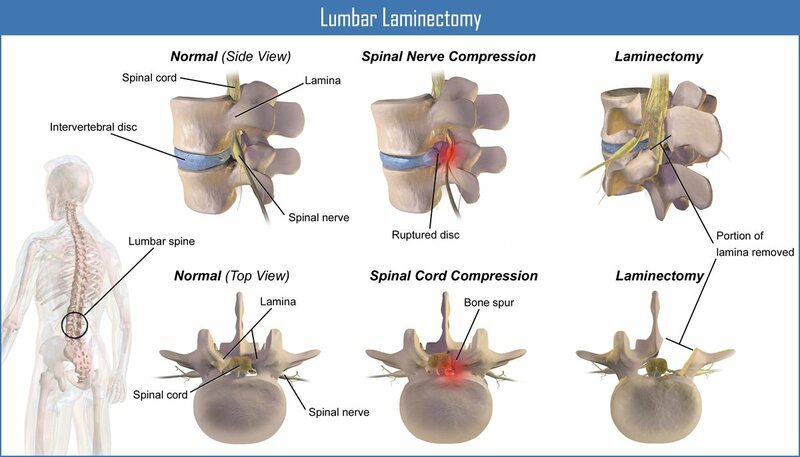 A laminectomy is usually performed under spinal or general anesthetic. It can take anywhere between one to three hours depending on the complexity of the procedure and the surgery technique. Before surgery, your surgeon explains the nature of your surgery, the reasons for it, the outcome and the possible complications involved. They should be able to tell you the exact length of stay in hospital that will be required and the number of weeks you will need to recover before returning to work. You may initially require inpatient rehabilitation (physiotherapy) for a short period of time. Your anesthetist will visit you to see how suitable you are for operation. Diagnostic tests, including blood and urine samples, are taken before the operation. You will have a ‘nil by mouth’ (nothing to eat) for a number of hours prior to operation. A pre-medication injection is usually given to make you drowsy and dry up some internal secretions. The position you are placed in on the operating table depends on the position of your herniated disc or narrowing. Your skin is marked for incision. The surgeon makes an incision through the skin. The muscle is then cut, peeled back from the vertebrae (spine bone) and held in place with special instruments called retractors. The lamina, which is between the bony projections of the vertebrae (the ‘points’ you can feel with your fingers) and the transverse process is either removed or drilled with small holes. What happens next depends on the problem. For ex; the surgeon may then trim the protruding bits of a degenerated disc. Once the surgery is completed, the surgeon confirms the spinal cord or nerves are not compressed anymore, and the muscle and skin are sutured and closed. The results with laminectomy to correct spinal deformities are usually good. 80% to 90% of patients have relief from their pain after surgery. Laminectomy is a major undertaking, and rehabilitation is important parts of helping patients get a possible advantage from their surgery. Essentially, rehabilitation (physiotherapy, exercises) can help patients recover from laminectomy as quickly and entirely as possible. Throughout your physiotherapy program, your physio keeps a record of your improvement and challenges. The progress with rehabilitation should be recorded and periodically shared with the doctor. Back Pain, Spine Surgery back pain, back surgery, bone spurs, laminectomy, Neck pain, spine, spine arthritis, spine surgery. permalink.